Old map by DE BRY - A picture of the Aloë, Maguey mexicanum & Sycomorg. Title: A picture of the Aloë, Maguey mexicanum & Sycomorg. 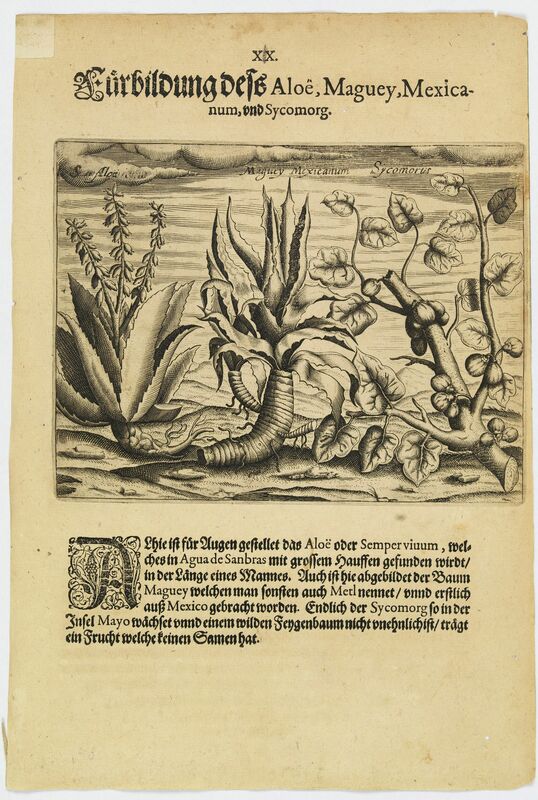 Here is the aloë, or semper vivum, which is as tall as a man and found in great numbers in Agua de Sanbras. Also the maguey, often called metl, grows here, but originates from Mexico. Lastly shown is the Sycomorg that grows on the island of Mayo. It is not unlike a wild fig-tree and bears a seedless fruit.